I have been a perfectionist since before I can even remember. I was scared to color as a child because I might have make a mistake. I avoided cooking because people might not like it. I even gave up on writing for a time due to the stress of feeling I had to attain perfection. Yet, I always found that I grew and became stronger when I faced these fears of inadequacy. Not only that, but whereas I used to be afraid of coloring I am now an artist. While I used to avoid cooking, I am now a baker who prefers technically difficult recipes and regularly creates their own recipes. Lastly, while I backed away from writing for a time, I found that when I had the strength to come back to my passion it only helped me improve further. It takes time to overcome perfectionist tendencies. Believe me, I know. I have been able to overcome my need for perfection in certain aspects of my life, but I still struggle with it in other areas. It is a constant battle to overcome. Yet, the battle is well worth it, as it can help you attain the goals which you have only dreamed of. I have found that it is important to constantly strive to do my best, which my perfectionist tendencies aid in. Yet, simultaneously, I must be willing to accept that mistakes are inevitable in everything, and I need to be willing to let them go. One example of this, I always edit my writing. But, I know that it is possible to miss a mistake. Even the great writers of eras gone by have made mistakes in their writing. Nobody is able to completely avoid these mistakes. I can strive to catch every mistake possible, but at some point, I have to tell myself that I have done my best, caught every mistake I am able, and be proud of the work I have accomplished. One thing I have found which helps is to realize that some “mistakes” are only a matter of opinion. For instance, I was taught to never begin a sentence with a conjunction. This includes words such as but, yet, however, and, so, or, and for. Yet, most major style guides and grammatical publications agree that it is perfectly acceptable to begin a sentence with a conjunction. Before you can begin to work on your individual perfectionistic tendencies, you have to come to a mental understanding that everyone makes these mistakes, you are unable to hold yourself to an unattainable standard, learn to forgive yourself, and most importantly you need to learn how to embrace mistakes as a chance to help you learn and grow rather than a reason to berate yourself. Here is one tip: when you feel overwhelmed by a goal and the need to be perfect, write out a list of your task and the various outcomes. For example, in my life, I feel the need to make holidays absolutely perfect. This includes making a ridiculous amount of food including thirteen pies, a turkey, stuffing, four types of cranberry sauce, and more all from scratch and by myself. Along with this, I also feel as if it is my responsibility to entertain everyone and keep everyone perfectly happy, all while I am overwhelmed. Not only is this more than a single person can realistically handle, but it is impossible to control everyone’s emotions and ensure their happiness. When I feel myself struggling in this way the list can include all of the expectations I am holding for myself, along with alternative outcomes. I can then cross out the unrealistic outcomes and replace them with those that are more attainable. It may be difficult to let my original goal go, but it is imperative for my well-being and mental health. Please, don’t continue to allow your perfectionism to hold you back from your dream. If I had continued to be ruled by my own perfectionist tendencies, then I would not be an artist, a baker, or even a self-employed freelance writer. It will take time, it will be difficult. However, I know you can overcome your struggles. Thank you for taking the time to read this article, I hope it encourages you to move forward with hope and strength. 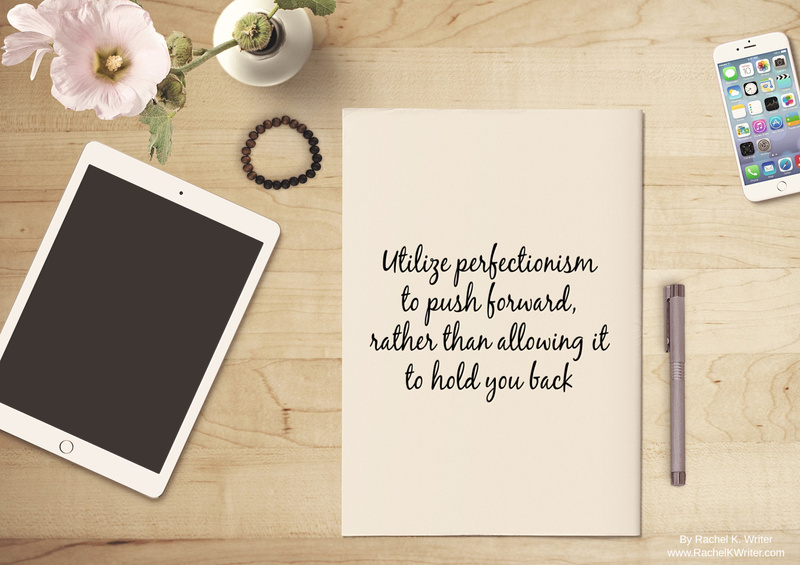 I was inspired to write this not only by my lifelong struggle with perfectionism, but also by one of the most recent books I was hired to write by a client. Last week, I mentioned being hired to write a 29,000-word book on productivity and overcoming procrastination. This week, I was hired to write a 10,000-word book on a similar subject, in which I went into detail on seven ways to increase productivity and reach success as a self-employed individual. If you are looking for a freelance writer for a book, article, or series of blog posts you can contact me at email@rachelkwriter.com. Working from home is wonderful. You have the ability to set your own hours, create your own work environment, escape difficult coworkers, and all of the comforts of home are around you. Let us not forget, coffee is only a hands reach away and nobody can judge your taste in office supplies. Yet, there are some difficulties when working from home, as well. The most common complaint I have seen and experienced myself is distractions. Whether the distractions are the people living with you, housework, or entertainment, the list of possible distractions is long. Thankfully, you don’t have to let the fear of distractions or the loss of productivity get in the way of your dream job. Whether the distractions come from your own inability to focus or having people frequently attempting to talk with you when you are on the clock, there are tips and tricks that can help. A clinical psychologist and former professor, Dr. Bill Knaus, has studied the subject of procrastination extensively. Dr. Knaus has found what he refers to as “paradoxical procrastination rewards.” While procrastination may give you short-term rewards that feel good at the moment, in the long-term they will obstruct your goals and create a cycle of further procrastination. While a supposedly “quick” coffee break feels satisfying, if you waste away over half an hour on your phone the time you have to work is further limited. This may seem like a small waste of time, but moments such as these add up without our realizing it. They seem so insignificant in our mind that we barely recall it happening. We most definitely do not realize how much time is passing when we are wasting these moments. While these paradoxical procrastination rewards may induce a cycle of procrastination, you can reverse it. One method of doing this is by setting yourself a goal, such as “I won’t look at my phone until I write one-thousand words”, and then sticking to it. During the beginning, it may be difficult to stick to your goal but it is vital that you hold yourself accountable in order to break the cycle. Dr. Knaus found that following a process such as this greatly reduces procrastination impulses within two weeks. Before long you will find yourself enjoying the long-term benefits of breaking the procrastination cycle, and you won’t look back. The number of outward distractions, such as your beloved family talking with you, can only be limited by a certain amount depending on your situation. If your distraction is people contacting you through your phone this is the easiest distraction to manage. Simply, let people know that you are working and set your phone to silent. Many phones even have options to send out an automated message when set to silent or driving so that it will let people know you are busy and will contact them shortly. Obviously, one of the most difficult outward distractions is when you have children or are the caretaker of someone else. Ideally, you will have times when another person is present who can take over parenting or caretaker duties, but if this is not the case do your best to set up a designated workspace and time. Hopefully, this will ensure that people know to disturb you as little as possible when you are in this space. If you are unable to set a designated workspace where people know to give you a little space, then I have found the most simple and effective solution to be a sign. I have previously used simple signs that I designed and printed out before hanging on the door. I have now upgraded to a magnetic whiteboard, which has been incredibly successful. I can easily customize my message depending on the day, and others can even leave me messages on it. If whiteboards are not your style, a chalkboard could be a cute shabby-chic or rustic option. While these tips help, the most important one is to communicate with your loved ones and those around you. They need to understand that you do not resent their interaction with you, but that your productivity and work is incredibly important to you. If your loved ones understand how important it is to you and have a clear understanding of when you are working so that they may give you space, then all you can do is hope they will honor your wishes when they are able. I don’t know about you, but I do know that the times I find myself procrastinating the cause is almost always stress. I find myself overwhelmed by the task at hand or outside circumstances, and before I know it I am just trying to find excuses to not work. Sometimes this means that I have gone long overdue without a break. Remember, breaks are an important part of the work process and not only give the body a chance to rest but the brain a chance to recuperate, as well. However, make sure that the break does not get away from you and turn into hours off of work. I prefer to time my breaks so that I do not stay kept away from work, but instead can go back to it refreshed. If the matter is not as simple as needing a break, but that you have something which is genuinely upsetting you, then the situation may be more difficult. Yet, we all have days that we have to work despite outward circumstances causing us emotional turmoil. Deep breathing, on its own or paired with either yoga or meditation, has been shown in studies to greatly reduce stress and balance the mood. According to The American Institute of Stress and Dr. Herbert Benson, this is because deep breathing creates a relaxation response. This response changes the way our body and mind react to stress. Some of the physiological reactions to the relaxation response induced by deep breathing include decreased heart rate, lowered blood pressure, relaxed muscle tension, and increased nitric oxide. Yet, this powerful relaxation response is not activated when we just lay in bed reading a book or sit on the couch and watch TV. In order to gain these benefits, we need to achieve a state in which our minds are active, focused, and calm while we are breathing deeply. The American Institute of Stress has even found that only twenty to thirty minutes of deep breathing from the abdomen during the span of a day can greatly decrease both stress and anxiety. Part of the way in which it does this is by increasing the oxygen flow to the brain, therefore stimulating the parasympathetic portion of the nervous system. I find that I am at my most productive after taking a short ten minutes to focus on deep breathing while doing a few stretches. These few minutes loosen up my muscles, refresh my brain, and I am able to go back to work mentally energized and motivated. I hope that these tips help you as much as they have helped me. 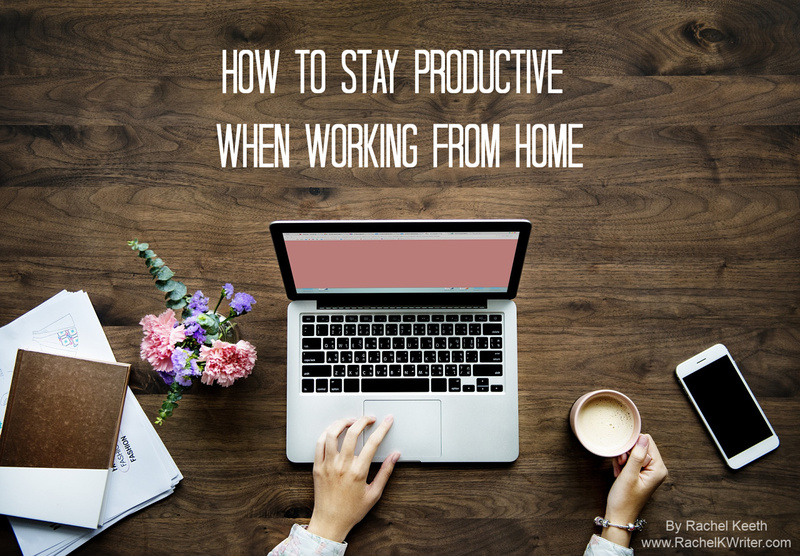 While working as a freelance writer is my dream and working from home has many benefits, that does not mean it is always the ideal environment. Yet, with these few tips, I find myself able to increase my productivity at least two-fold. I was inspired to write this article not only because I constantly find myself needing to use these tips, but because the most recent project a client hired me for was ghostwriting a witty and humorous book on beating procrastination and increasing willpower. This book was not only fun to write, but it was fulfilling to provide information that I have found helpful myself that is also backed by science. If you are interested in hiring me as a writer to provide you with articles, manage a blog, or ghostwrite a book you may contact me at email@rachelkwriter.com. Throughout time women have been changing history. Some of our best examples of powerful and influential women are royalty, be they princess, dutchess, or queen. Yet, we are told that wanting to be like these brave women is childish, that only girls can admire princesses, and that these women are superficial. This perception of royal women being something only a child can admire is a shining example of the way in which women are often looked down upon and diminished. There are many influential women we could look as examples, but in this article, I will share three of my favorite women of royalty. While originally beginning her role as princess and then queen consort, once Hatshepsut’s husband died and her two-year-old nephew took the throne she became regent. During her seventh year as regent, she crowned herself king. The reason for this is unknown, but it seems to have gone unchallenged. Therefore, historians surmise there may have been a political event that required a full-fledged king. Regardless, Hatshepsut was able to retain her power throughout her entire life. During her ruling as king beside her nephew, who was also king, she was able to attain even more power than he was. It was not until the time near Hatshepsut’s death in her seventies that her nephew began to have nearly as much power as his aunt. During her reign as king, Hatshepsut accomplished overseeing the development of many building projects, including the famed temple of Deir el-Bahri; promoted foreign trade; embraced the arts; and she was able to successfully maintain peace for the Egyptian empire. Lakshmi Bai became the Rani (queen) of Jhansi when she married Maharaja Gangadhar Rao. However, when he began to pass away without an heir the royal couple adopted a child who was a close relative, as was Hindu tradition. While the child was legally theirs and was a respected practice for a ruler without an heir, the British government took this opportunity to claim the heir as invalid. Queen Victoria rejected the appeal of the Jhansi government, took control of the throne, and seized their state jewels. The British government continued to hold power over the Jhansi people until a rumor began that the British soldiers were coating their bullets with the blood of cows and pigs, which is unclean for those of the Hindu religion. When a revolt broke out with the inmates of a local jail participating, not only did they kill the British officers guarding them, they also attempted to kill the innocent family members. Lakshmi gave shelter to these families in her home, protecting them from the revolters. Soon thereafter, the British government was forced to focus elsewhere in India, giving Lakshmi the opportunity to regain her throne and prove herself. When the British attempted to retake Jhansi she was willing to fight for her people and country, so she led a revolt on the front lines. After battling in a fort for four days with twenty-thousand rebels their defenses fell. With her child strapped onto her back, Lakshmi and her aides fled the area on horseback and went to join the remainder of their forces, which were stationed nearly one-hundred miles away. Lakshmi once again formed a battalion and readied to overtake the British forces at the fort of Gwalior, which was a few miles away from Jhansi. Despite having the upper hand, the British lost the fort due to Lakshmi’s successful tactics. Sadly, a few days later the British army once again recaptured the fort, forcing Lakshmi and her son to once again flee. Dressed as a man to disguise herself, on horseback, with a sword in hand Lakshmi fought to get away. Although, the British soldiers were too fast and inflicted mortal wounds upon her before she was able to escape. Before dying in a secluded space she succeeded in saving the life of her son and handed him over to a trusted friend and general. As Marie-Louise Dutchess of Austria, who was the great-niece of Marie Antoinette, was growing up she was taught to despise France. This was worsened when Napoleon led the French military to her home of Austria, causing devastation to her country and requiring her to flee to Vienna for a year when she was fourteen. The diary of Marie-Louise gives us a look into how she was feeling at the time. She wrote: “the French ogre was said to be the Beast of the Apocalypse” and after mentioning that his death had been predicted for the year, “how happy I would be if this were true“. A number of years later, after having her mom pass away and father remarry, Maire-Louise was again forced to flee when war once again broke out between Austria and France. We can find more about Napoleon in her diary at this time, her having written: “to see that man would be the worst form of torture“. Yet, she did not know that her family was negotiating with Napoleon who was seeking her as a new wife, in want of a woman who could give birth to an heir. Once Marie-Louise was finally informed of these negotiations she wrote a friend and simply but bravely said: “I wish only what my duty commands me to wish.” However, she did also mention that she was making “a painful sacrifice” for the good of her country. Despite being forced into a marriage to bear the child of the man she most hated and who had committed countless atrocities, Marie-Louise went into it willingly and bravely for the sake of her people. While princesses and queens are seen as something only girls during their early adolescence should aspire to, the actions of these prominent and brave women can inspire us all. Whether we need the courage to get through a difficult day at the office, the loss of a loved one, or when taking on a new endeavor. We can look at these royal women throughout history to encourage and inspire. Thank you for taking the time to read this article. 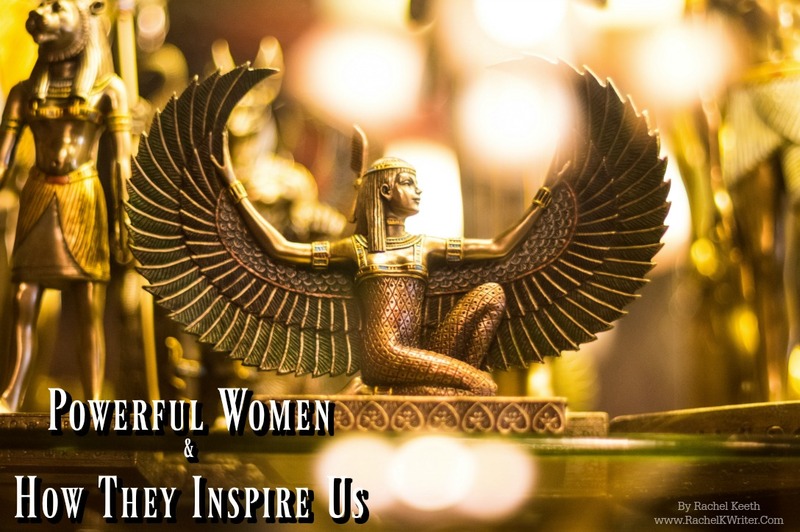 Recently, while I was writing a book on ancient Egypt and its most prominent kings and queens for a client I found myself inspired by the many powerful women in Egypt’s history. If you are interested in working with me please check out my Services page for my rates and message me at email@rachelkwriter.com.